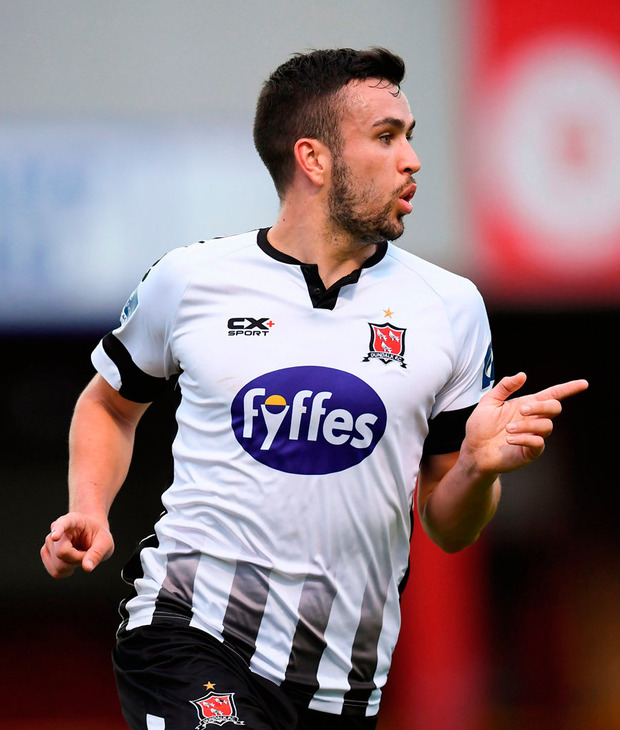 Michael Duffy was both scorer and then provider at the Showgrounds as Dundalk pulled clear at the top of the Airtricity Premier Division last night. The 2-0 win was the 13th successive league victory for Stephen Kenny's side and came courtesy of a slick Duffy first-half finish, and a late second for the league's top scorer, Patrick Hoban. It leaves the Lilywhites three points clear of champions Cork City, with a game in-hand and eight league matches remaining. When Dundalk eventually found their rhythm, the opener arrived on the half-hour, as Duffy was given too much room on the left, and he had time to pick his spot and curl the ball into the bottom corner. The game then swung back and forth for the remainder of the first half, while the second half was a cagier affair. Duffy remained the main threat and another skilful break on 75 minutes almost resulted in a second goal, only for Mitchell Beeney to make the stop. But from Duffy's resulting corner, Hoban was left unmarked to head home his 25th goal of the season.